In July 2013 I started up the cactus nursery in the spare bedroom. I bought two simple and open standing wood racks from IKEA with four adjustable shelves. And because IKEA are quite good at practical solutions, I could easily connect them to make one big rack. This way I could hang the artificial lighting from the top shelf and have the plants at a suitable distance from the light and a comfortable height for me. It also allowed for shelf space underneath the plants for storage of various items such as labels and soil. and with storage space underneath for various things. I bought plastic trays from the plant store Plantasjen here in Norway, and initially also square plastic pots from there. These are very flimsy though, so I soon began buying square plastic pots from Kakteen-Haage which are far more sturdy and suitable. I now predominantly sow in 5 cm square pots. 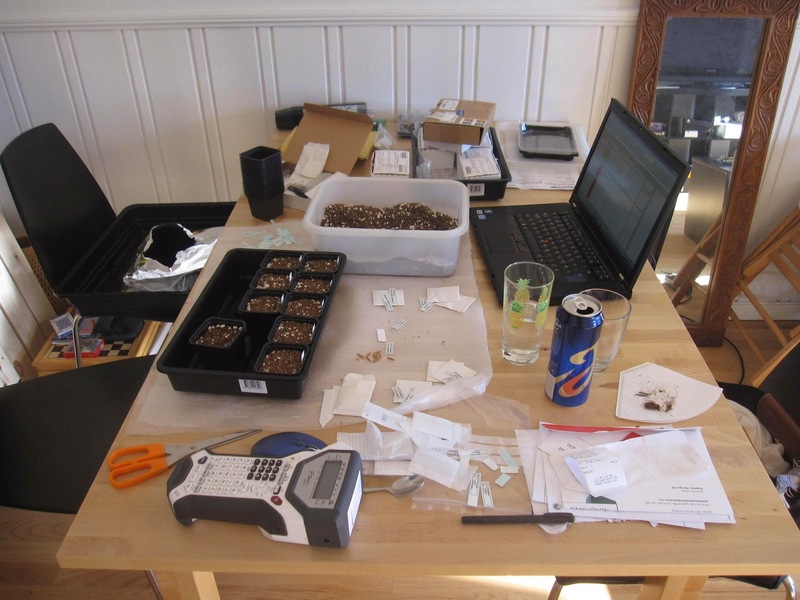 But for the first batch of sowing in July/August 2013 I used the other pots from Plantasjen. Some of the trays were of a kind that comes with it’s own transparent plastic lid to create a mini greenhouse. 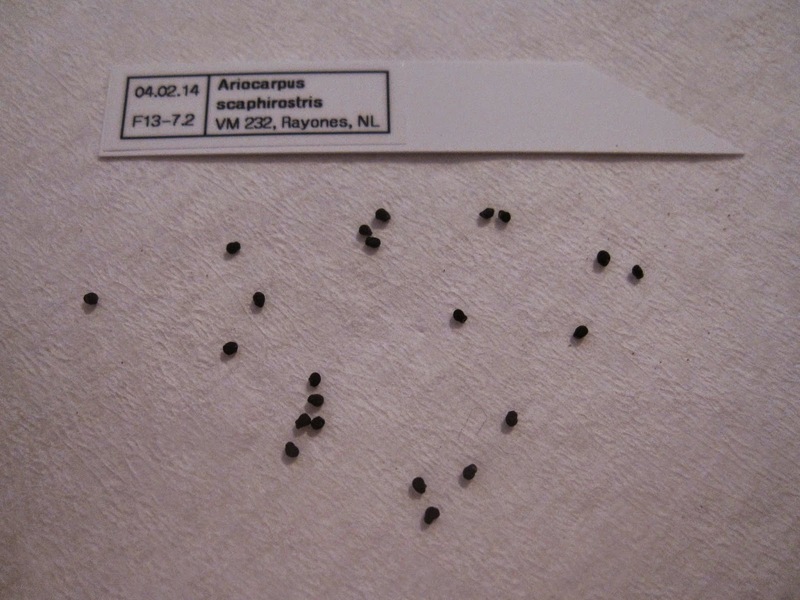 I used these for the first batches of sowing, placing individual pots inside them (see image above). In the middle of sowing. On the lower left is the extremely useful label maker. I bought labels from both SuccSeed in Sweden and Kakteen-Haage in Germany. I also bought a Brother label maker which has become a completely essential tool for me. My handwriting is terrible, so to be able to actually print the labels was a revolution. To specify, I don’t print the white hard plastic labels themselves, but rather labels with one adhesive side to stick onto the white labels themselves. I can fit quite a lot of information on one label. Closeup of a white plastic label with the printed label stuck on. The plastic label is almost 80 mm long tip to tip, and 14 mm wide. with room to spare. This label was made 04.02.14. Among the various other equipment I bought were razor blades and sharp knives for grafting, a pH measurement kit to check the water, various fertilisers and additives, different kinds of soil components, various kinds of pots, a thermometer and I’m sure some other stuff as well. Some of the above I’ll get back to in much more detail in future posts. The next post will deal with artificial lighting! Just curious what stock you are using for grafting your seedlings. Pereskiopsis are a solid choice, though they grow in much a tropical manner, requiring more frequent watering and humidity. I would encourage you to visit: http://pereskiopsis.com for more information. How long have you kept the IKEA nursery layout? 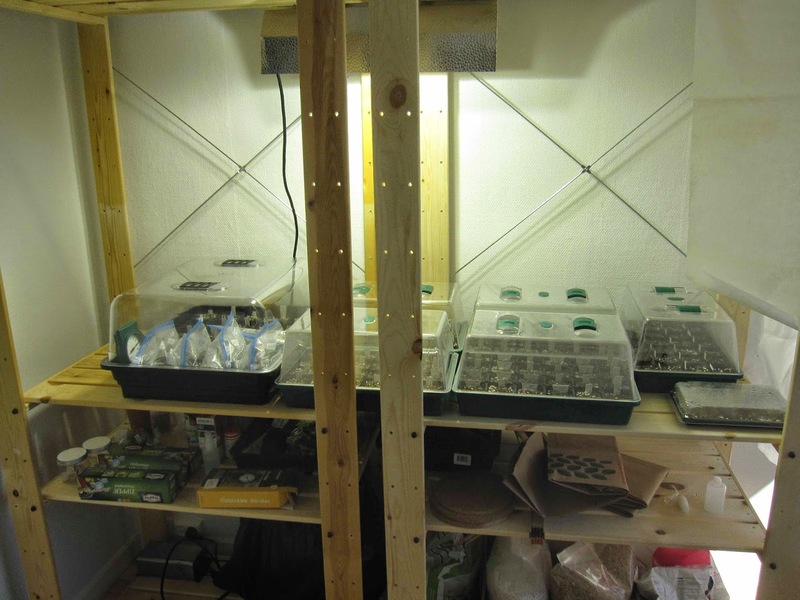 I’ve used those same shelving units before and actually had severe problems with the wood warping due to changes in the humidity of the room from growing my tropical plants. I ended up switching to stainless steel. Thanks for the link to the website. Lots of good information there! Do you run it? I use Pereskiopsis for seedlings, although I don’t graft very often any more. I prefer to keep my plants on their own roots as much as possible, although I do sometimes graft seedlings of particularly rare species to encourage quicker seed production. I have tried Selenicereus for seedlings before as well, though I find Pereskiopsis to be preferable. My IKEA shelves are set up in an ordinary room with the door always open (window too except in winter). The humidity levels only go up if I keep the door (and window) closed. We usually hang our clothes to dry in the same room and they’re mostly dry in a day, so the humidity is quite low in there. I’ve never had any issues with the shelves.